Two-factor authentication is a type of multi-factor authentication used to add extra security to online accounts. With two-factor authentication, users must complete an extra action in addition to entering a password. A password alone is no longer enough credentials to access an account once two-factor authentication is used. The extra login step may involve logging in using a registered device, responding to an email or text message, answering a phone call, interacting with an app, or inserting physical hardware. One of the easiest 2FA methods is to send a text message to the account holder’s registered phone. 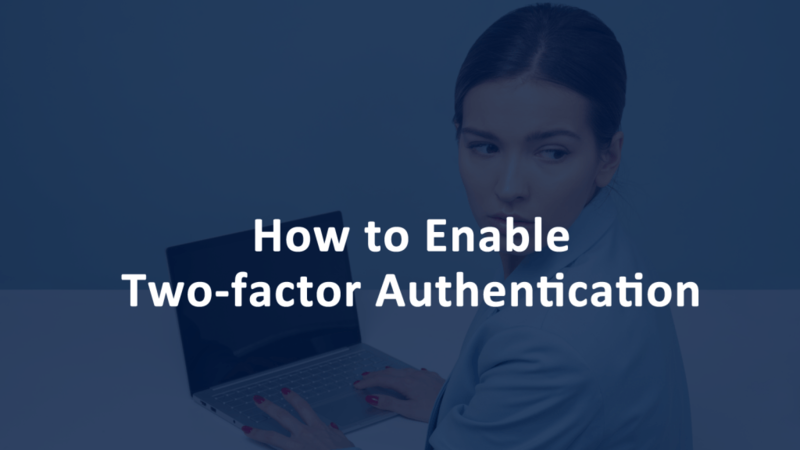 Two-factor authentication is also called 2FA or two-factor verification. Multi-factor authentication is also known as MFA. Passwords are easily stolen. Two-factor authentication ensures the correct people have the appropriate access to information including emails, financial accounts, and corporate information. It can be used to help protect your account from unauthorized access and dramatically increases account security. Two-factor authentication can be perceived as making the login process cumbersome and difficult. Hardware tokens were one of the first forms of 2FA and involved the user having to keep a FOB with them at all times. With a FOB the user must plug the key into a USB port on a computer. Connecting a phone number to an account or associating a device can be used to receive verification codes by SMS text message or automated phone call. Trusted devices can be associated with accounts and used to verify user identities by displaying a verification code when there is a sign in attempt on another device or browser. How Do I Get Two-factor Authentication? Google also supports two-step authentication. Google users can enable two-step verification for each of their Google accounts. There is also a more secure form of 2FA available for Google accounts when the Google Authenticator is used. You will be prompted to enter your password. After that, follow the steps on the screen which involved adding a phone to send text messages to when anyone signs into your Google account. Google Authenticator is an Android app that enables two-step verification using the Time-based One-time Password Algorithm and HMAC-based One-time Password algorithm. Android mobile device users are authenticated on Google mobile devices using the app. The Google Authenticator app can receive 2FA codes even if there is no internet connection or mobile service. The Google Authenticator app can be installed on Android devices running Android version 2.1 or better. Your Google accounts must have two-step authentication turned on as described above. Google Authenticator can support multiple Google accounts on one device.